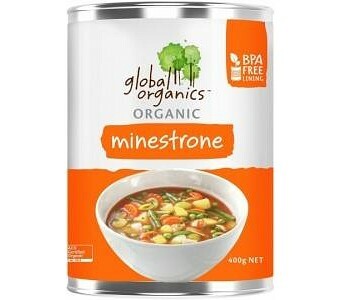 Global Organics Organic Minestrone Soup is packed with organically grown vegetables, in a BPA-Free can and free from artificial flavouring. Enjoy it on its own or for an extra wholesome and hearty meal, accompanied by your favourite bread. Ingredients: Water, Carrots* (10%), Tomatoe Puree*, Potatoes* (8%), Peas* (7%), White Cabbage*(5%), Snap Beans* (4%), Leak* (4%), Onions (3%), Sunflower Oil*, Vegetable Stock* (sea salt, onions*, carrots*, leeks*, parsnip*, parsley*, tumeric*, garlic*, nutmeg*, lovage*, pepper*), Sea Salt, Guar Gum* (412), Parsley*, Pepper*, Lovage* *Organic Ingredients. May contain traces of gluten.